Tiger census has gained a lot of public attention thanks to the Aircel Campaigns sharing that there were exactly 1411 tigers left in India. Many in India, have questioned the authenticity and the reliability of the census figures and maybe even the methodology. Even an ignorant like me, had a point of view. Mounting pressure and public attention has now resulted in census no longer being a forest-department only exercise. It seems the management at National parks now actively seek volunteers who can witness, contribute and validate the census. And may be become a tiger activist or a conservationist one day. Thanks to all these previous efforts of very many people, I got my first chance to spend one full day (yes thats 24 long hours) perched on a machaan, in a jungle that the Tigers call home ! My friend registered my name as a volunteer for this and I was thrilled at the opportunity. I took a morning bus on Saturday to reach Jaipur. The next day we drove out early morning to Sawai Madhopur and reported at the Ranthambore National Park”s main office. It was total chaos. More than 50 jeeps, 10-15 canters (long open roof mini-trucks which can seat 20 people used for the safari) and more than 200 guards, volunteers (one could easily identify them from the sheer excitement on their faces), members from Press and professional photographers (this is the category I identify with Bazooka lenses) were all eagerly waiting for the day to officially begin. We were issued our areas and given our supplies – huge water campers, first aid kits, packed food and the census form. 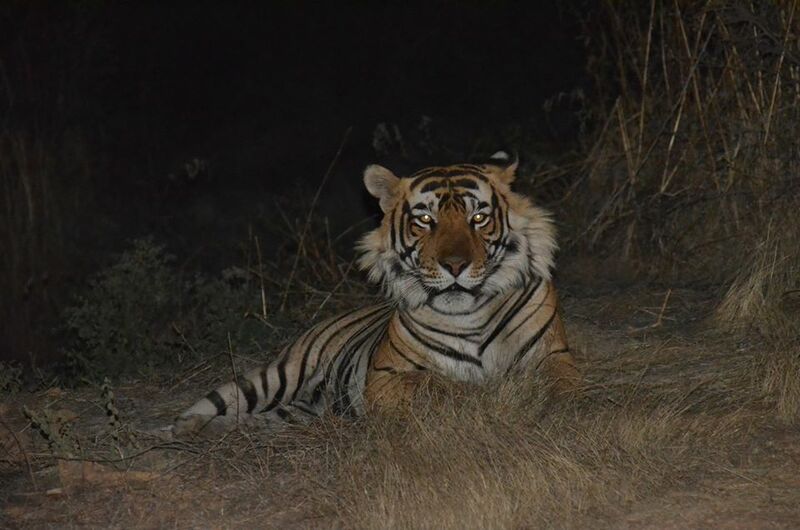 I am told that Ranthambore NP covers around 430 sq kms and is split into multiple zones. We got the Qualji area, which is almost 30 Kms away from the main zone. We drove out to the forest office at Qualji and waited for the rest of the troops to join us. After 3 rounds of somewhat bitter Rajasthani tea, we had the required quorum for the Ranger saab to initiate the proceedings. We picked our supplies, took out the daris, the cameras and climbed onto the jeeps to head into the forest. The ranger saab stopped at the first machan , which was built on a not-so-tall babool tree and provided splendid view of a large waterhole infront of it. It was surrounded by thorny bushes (hopefully that was the deterrent for animals to come close) and there was nothing blocking the view for almost 270 degrees. I got down with my stuff, but saw that two gents were already there. I had briefly met the duo who were part of the Gujju gang from Ahmedabad. They requested me to take up another post as the friends wanted to be together. My friend, who had told the ranger to allocate me a nice spot, told me to go ahead and take this one, but I decided not to. So I told the ranger that I am fine with any other spot, so long as the chances of a tiger visit are high. A guard I had befriended during our chai session told me he knew the perfect spot along the river. He said its right where 2 tigers and a leopard have been spotted very many times. I trusted the fellow and said lets go. We drove down the tracks to the river bed and then hiked about half a km with our stuff towards the machan. Our machan was on a thick white tree, some 30ft off the ground. On our right was the riverbed, somewhat dried which forked the shallow river into two streams. Our side of the riverbed rose into a mud hillock some 15 ft up, which meant the machan itself was just 15ft away from the ground. We were supposed to spend one full day on the machan and keep a log of all animals which came out to this watering hole. The empty sheet had clear rows for tigers, leopard, bear, jackal, fox, wild dogs,peacocks, sambhar, chinkaras, cheetals and a few more. We took our positions around 3 pm and started the vigil. The sun was so bright and strong, that we only focused on keeping ourselves hydrated and trying to build a shade with some dari. 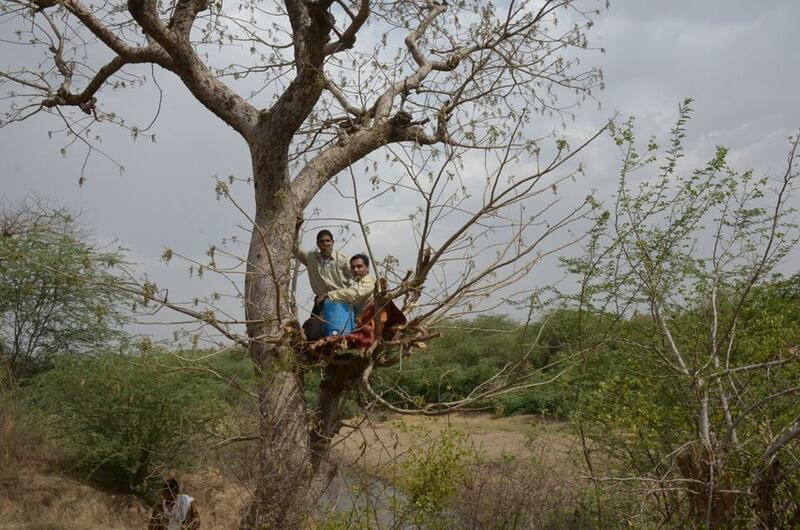 Around 5, my companion RajKumar decided to climb further up on the tree to get a better view. By the way, did I tell you he is a master black belt, commando trainer who looks really intimidating. Even at 47 years he climbed up the tree like some young recruit fresh out of army boot camp. So while RajKumar was giving me a count of all the deers and peacocks he could see from his new “seat”, I decided to stretch my legs and save my energy for the night vigil. Darkness fell and my excitement started increasing, coz suddenly I could hear so many more sounds. I feel our ears hear better when we are not distracted by the sounds. While it was the night after a full-moon, it was still very dark due to a thick cloud cover. Around 8.30pm the guards came to our machan in their jeep, with packed dinner. RajKumarji climbed down (he knew I would find it much tougher than him to climb down and back up, ha ha), collected the food and came back on the machan. The guards called out to me, and told me “Wribhuji the first machan that you were supposed to be on, was lucky. The tiger was there for almost 80 mins before sunset.” And my reaction was, something better would happen now. The guards had left for only 5 mins and Rajkumar had downed 2 pooris, when we heard a clear roar, somewhere down the river. The roar gradually started getting louder as if the cat was moving down the river towards us. We became really quiet, lest the tiger should decide to move away. It was so dark, that while the roars were telling us that the tiger was somewhere right below our machan, we could see nothing. I managed to take out my phone, and start its voice recorder. Kept it under 3-4 layers of a thick towel, so that the light doesnt go out and disturb the cat. While we were sitting very still and enjoying this amazing experience, Rajkumar ji pointed to the mound infront of us. i could see nothing and after a few seconds we were back to looking down at the river bed, trying to figure out where the tiger was. Suddenly we heard some shuffling on the mound and then a deafening roar. And we saw the outline of a tiger on the mound moving fast towards us. In a matter if 3 seconds, the tiger roared twice and charged at us jumping in the air, but deciding to stop almost 5-6 ft away from us. Many asked us, if we were scared. Truth is, it happened so fast that I could hardly react. The tiger then stepped back and lay still. We were equally still and quiet. For the next 15 minutes neither we moved nor the tiger. All we could see was its faint outline, not even sure if it was looking in our direction. After 15 minutes we saw its shadow bolt into the jungles on the left and we heard a distant roar. All this while, the tiger under our machan at the riverside was silent. It roared again a few times and the roars grew faint and finally could not be heard. We realized we had the great opportunity to be in the presence of two tigers. We heard them both, but only one showed up to say hello ! In the morning when we recounted our experience to the ranger, he told us that the tiger that charged was T 42 who was on its way to the riverbed to meet his girl friend T37. The two have been trying to mate for the last 3 days and we spoiled it for him on that night. I could suddenly understand why it had charged at us :-).